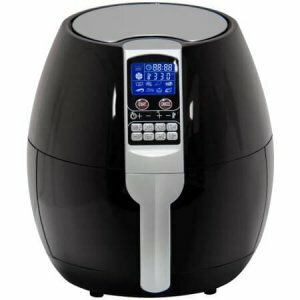 This air fryer has got your next party covered, with rapid air fry technology that cooks your food the healthy way! Say goodbye to fatty oils and hello to delicious home-cooked fried food. Based on the Electric Air Fryer reviews and our own investigation we try to define, which model is the most suitable for customers. We’ve evaluated the pros and cons of each model and laid out the main benefits of each one. They all are of great quality and provide oil-free and fast cooking. However, the choice is always based on personal requirements. As for us, BCP SKY2766 has proven to be an excellent helper; it also provides an opportunity to cook two separate meals at the same time. Best Choice is a company that supplies a number of different products to customers. A lot of their products specialise in outdoor entertainment and gardening. They also have quite a few fitness products on the market, as well as various toys and games for children. 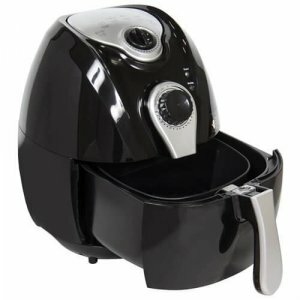 The other part of their production is dedicated to the home which is where we find an impressive range of Air Fryers. But which is the best oil-less fryer that those at Best Choice offer? And based on consumer reports Air Fryer is the new thing to have in your kitchen, so what is the best one to go for, for you? 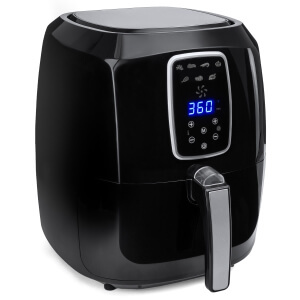 The first model that we have to look at is the Best Choice 4.4 Quart Air Fryer. 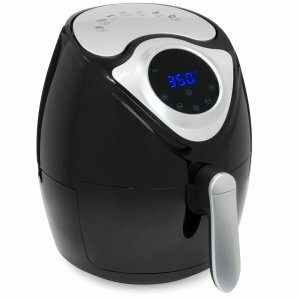 Not only boasting a very good size and cooking capacity, this Air Fryer also shows us that you don’t always need a big price tag in order to deliver quality and quantity, as it is only priced at just under $60. This model comes with a fully detachable basket, as well as tongs too so you can ensure your own safety when it comes to cooking something up nice and hot. Customers have loved the price of this particular appliance, and you do get an amazing appliance that is made incredibly effectively for a very low price tag, you won’t find a price like that many other places. This model has two very easy-to-use dials that help you to control the heat and temperature you are working at. The tongs and grate are a fantastic addition as you can turn things over when they need to be and also separate two different foods, allowing you to cook multiple things. Some customers have complained that this particular model doesn’t have a great shelf life, some say it only lasted 6 months before it began to malfunction. This next model is definitely a bit of a step up from the previous one. Here we have a whopping 5.5 Quart capacity, allowing you to cook a large amount of food at one time. We also have a LCD screen displaying cook temperature and timing, as well as a few other nifty little touch screen buttons rather than the two dials. You get all of these extra features for just about $20 more than the previous model which is pretty impressive too! This Fryer has a huge capacity so is perfect for larger families that all want to get in on that fried food taste without the guilt of smothering it all in oil. This model has preset buttons on the front dashboard, this allows you not to waste any time looking up the perfect timing and temperature of your dish, and instead enables you to click one button to begin your process! This model also has a great circuit protection, helping you fend off any circuit problems. Those that have used this have noted that the basket isn’t the best quality. It begins to peel after a few uses and can affect the quality of your cooking after that. Here we have a fryer with around the same sort of capacity as the first one that we saw. The only difference is, that this one comes with buttons allowing you to enact 8 different preset cooking modes. It also has a modern-looking LCD display that some may find a little bit easier to use than a pair of dials. The 8 cooking presets allow you to start cooking up a storm with just the click of a button, choose from your favourite dishes including: chips, steak, shrimp and others! The rubber feet that the Fryer sits upon are sturdy and will not let the Fryer slip at all, ensuring safety is the name of the game. This Fryer’s display allows for a more in-depth control of your cooking experience. The LCD display can look quite confusing and crowded at times, you wonder if its all actually needed that much. This model is probably the smallest one on our list, though the price of it doesn’t really show that all too much. It’s a compact little Fryer that can fit up to 2.7 Quarts of food in it. It has a beautiful LCD screen display and also has cooking tips on the top. This models LCD display is nice and simple to help avoid confusion when controlling it. The cooking suggestions on the top of the model are helpful and give good ideas to the user of what they could make. It has automatic shut off technology, ensuring that you never run the risk of any hazards. The capacity of this model is very small indeed, probably best suited to someone on their own or possibly a couple. Best Choice offer a range of different models for customers to choose from, but not all of them are worth your time. The 2.7 quart one just doesn’t have the capacity, and the price is well too steep. The model with 8 cooking presets has a complex and difficult to use screen that is not desirable at all. If you are looking to purchase one that is worth your time, have another look at the first two as they are the ones that are good value for money.